Lamb and Bees staff secure win with a shut-out! Saturday, May 15, 2010 was a day to honor the Armed Forces at Community Field in Burlington, IA. 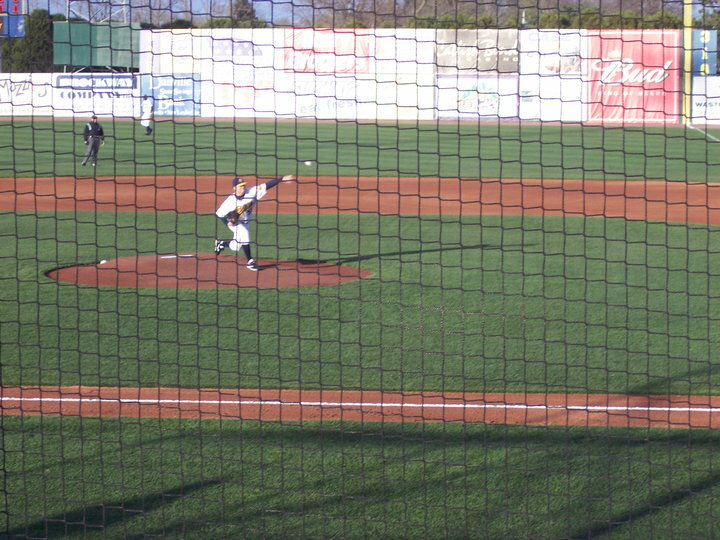 John Lamb was up to the occasion by bringing out his own left arm gun to attack the Peoria Chiefs in front of over a thousand fans and give the Burlington Bees their first win against the Chicago Cubs minor league affiliation. Lamb (W, 2-3) twirled a season-high seven innings, during which he allowed four hits, walked one, struck out three, and lowered his ERA to 1.58. Dusty Odenbach and Ryan Dennick pitched a scoreless eighth and ninth to close out the Bees’ first shutout of the year. The Bees posted 4 runs to secure the win against the Chiefs for the first time in the Midwest League schedule. His last three starts have been very efficient and the Bees coaching staff, and Royals organization, rewarded his effort by calling him into the office after the last out of the game. John Lamb called me right after the good news to share being called up to the next level in Wilmington, DE. He was obviously excited about the opportunity to continue his professional baseball challenges in the Carolina League at the High Class A level. Still only 19 years-old until July, this will mark the fourth move for Lamb in less than 12 months of playing minor league baseball for the Kansas City Royals organization. I’m sure he is loving his hat collection and memories from each stop along this journey. 4th hat in John Lamb's career! The move will be officially announced on the leagues transactions database tomorrow per the pregame interview with Lamb, before today’s last game in the series with the Chiefs. Our entire family and friends are extremely proud of his continued success with the different uniforms he has worn throughout this past year of his career. Especially since recovering from the injury he suffered in the 2008 auto accident that denied him playing his entire Senior season at Laguna Hills High School. We continue to wish the Burlington Bees success during this season, but now we have to say “GO ROCKS,” as well! ← Lamb gets first win, as Bees take the series in Beloit, MI.